The single best performer on the S&P 500 has returned roughly 100% since the start of 2017. However, it's over longer time frames that investors can enjoy truly eye-popping stock price gains. 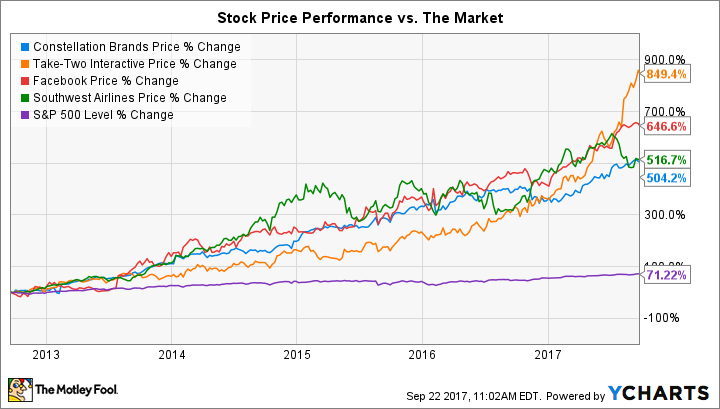 Netflix shareholders, for instance, have logged the market's highest returns over the past five years, with growth approaching 2,200%. Below, we'll look at a few companies with lower, but still impressive 5-year growth rates. Constellation Brands (NYSE: STZ), Southwest Airlines (NYSE: LUV), Take Two Interactive (Nasdaq: TTWO), and Facebook (Nasdaq: FB) have each returned 500% or more since 2012. Constellation Brands made a bold bet on beer a few years ago that just keeps paying off for the company. Its beer portfolio, which it purchased in 2013 for almost $5 billion, is benefiting from soaring demand for imports like Corona even while the light and craft beer segments are struggling. Healthy sales growth has made room for rising prices that have in turn pushed profitability to 30% of sales today -- up from less than 20% back when Constellation Brands was just a wine and spirits seller. The company believes it can continue that growth streak, so it's pouring resources into expanding its Mexican brewery capacity this year. Most of Take Two Interactive's stock price gains have come over the past year, and that suggests the spike is tied to the brightening prospects of the video-game industry. After all, its larger rivals Activision Blizzard and EA are soaring, too. Investors are excited about the impact digital downloading is having on the video-game business by making it easier for developers to cash in through frequent content releases. Take Two has relatively more room to grow, here, given its smaller sales base. But it will first need to fill out its portfolio with a few more hit franchises to complement its Grand Theft Auto blockbuster. Facebook looked expensive to many investors when it went public in 2012, but the social media giant has soared well past that early valuation on the strength of incredible growth. The company has notched a few truly amazing wins over that time, including adding 1 billion new users while pivoting its entire service onto mobile devices from its desktop focus. That shift didn't have the dampening effect on profits that Wall Street predicted, either. Facebook last year booked over $10 billion of earnings, up from $3.6 billion in the prior year. With the company running out of room to add more advertisements to users' feeds, that expansion pace is expected to slow. But CEO Mark Zuckerberg and his team still see a bright future ahead as the service becomes more engaging through rich media like video and virtual reality. Because of huge fixed costs and tight government regulations, it can be difficult to generate consistent profits in the airline industry. But Southwest, through its efficient cost leadership approach, has overcome those poor odds to put together an impressive string of operating wins since 2012. Expenses have held steady at roughly $17 billion since that time, while revenue steadily climbed. As a result, operating income soared to $3.8 billion last year from $700 million five years prior. The positive moment continued into 2017, with a record passenger load percentage helping revenue hit a new high of $5.7 billion. Each of these stocks has a good shot at extending its rally as business results continue improving. Out of the group, though, I'd bet on Facebook enjoying the biggest gains over the next five years. Sure, there's no telling what the social service will look like in 2022 when Facebook marks 10 years as a public company. Yet the company has demonstrated flexibility in pivoting from desktop to mobile, and that ability is likely to come in handy as it navigates future disruptions and works toward adding its next billion users.